The latest menu in the dining room featured this appetizer, which was previously very successful as an evening special. 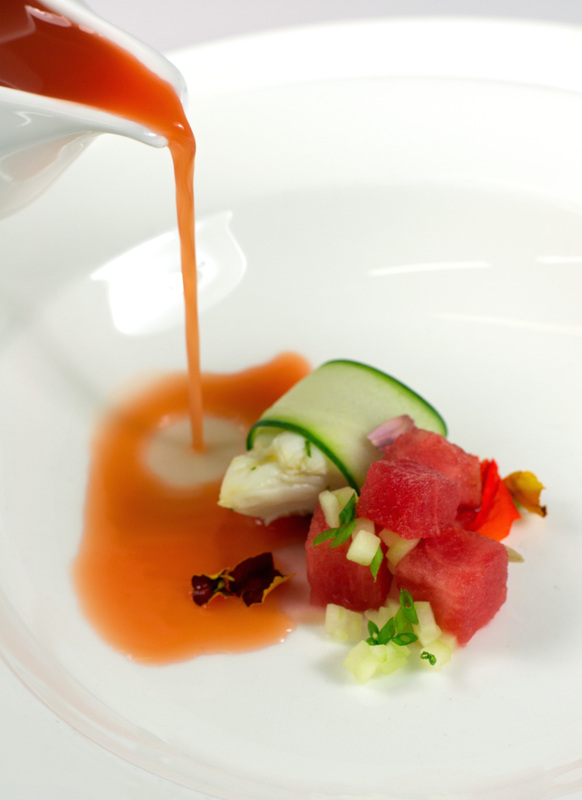 It features watermelon gazpacho, which is poured table side, over a garnish of compressed watermelon, cucumber, snipped chives, edible flowers, jumbo lump crab meat and sliced cucumber. Gazpacho is a very old Spanish preparation, dating back to the days of the Roman empire. Traditionally, it is a cold soup which is prepared with vegetables, olive oil, vinegar, and crusty bread. These days it is more often presented as a more finely pureed mixture of fresh vegetables (usually including peppers, tomatoes and cucumbers), olive oil and aromatics such as garlic, cilantro and shallots. It is still often finished with olive oil to give it body, sheen and acidity. This preparation of gazpacho was meant to be lighter, even, than the traditional preparation. It was produced by pureeing watermelon, jalapeño, red bell peppers, garlic, cilantro, fresh lime juice and cucumbers, and then straining it multiple times through a fine chinois. It was poured table-side over a garnish of jumbo lump crab meat, snipped chives, sliced cucumber, edible nasturtium, and “compressed” watermelon and cucumber, which had been vacuumed in a cryovac bag to increase their density and flavor. Posted in Appetizer, Summer, VegetableTagged chive, cucumber, edible flowers, gazpacho, soup, summer, watermelonBookmark the permalink. OMG! PLEASE, HOME COOK WANTS THE RECIPES!